Indian head massage is based on the ayurvedic system of healing which has been practiced in India for over a thousand years. The aim of Indian head massage is to release the stress that has accumulated in the tissues, muscles and joints of the head, face, neck and shoulders. When you come for Indian Head massage at Stress Project you will sit, fully clothed, in a massage chair for the treatment. The session will last for 30 minutes. It does so by applying pressure to certain points on the neck, shoulders and head that correspond to each Chakra (which is a similar approach to that of reflexology). This unblocks the Chakras, and allows for a free flow of energy around the body, restoring the individual to optimum health and feelings of wellbeing. Indian head massage is especially good for relieving stress, tension, fatigue, insomnia, headaches, migraine and sinusitis. Many people say that the experience is deeply calming and relaxing, leaving them feeling energised and revitalised and better able to concentrate, and helps increase joint mobility and flexibility in the neck and shoulders, improves blood circulation and lymphatic flow, frees knots of muscular tension, relaxes connective tissue, and aids in the elimination of accumulated toxins and waste products. 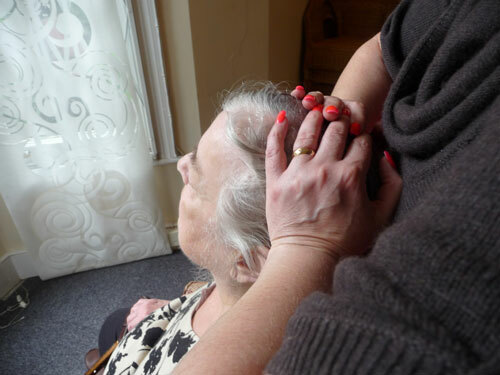 Indian Head Massage is offered at the Drop-ins, depending on availability. See also Massage, Chair massage, Reiki, Shiatsu and Reflexology. £8 per 30 minute session. £15 per hour treatment, when available. Drop-In sessions are on a first come, first served basis.